Congratulations on your upcoming wedding! We know that planning a wedding can be both exciting and stressful. All those appointments and details can really add up and almost become a full time job! If you’re thinking of incorporating a wedding slideshow in your reception or for sharing online, we have ideas to help you create an unforgettable slideshow that is inexpensive and fun to make without having to hire another vendor for the production. 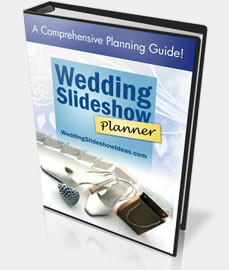 Anyone Can Make Beautiful Wedding Slideshows! What do we mean by that? Well, did you know that you or your friends can actually create a wedding slideshow for your special day that looks better than most slideshows created by wedding video editors? The best thing is that you don’t need any special skills or software. If you know how to use a web broswer, you can create an amazing wedding slideshow using a website called Animoto. It’s really super easy and you can do it from your Mac or PC from anywhere in the world. Before you begin, we highly recommend that you first read some of our articles at Wedding Slideshow Ideas to help you prepare. Click on the Blog tab at the top to see all the posts. We even have video tutorials to get you up and running fast! A few are featured in the sidebar on the right. If your wedding day is still a few months away, please bookmark our page in your wedding bookmarks. Also, share our site with others by using one of the sharing options on the left of the screen. We hope you will find some useful information here that can help make your wedding plans a little smoother!